Kevin completed his undergraduate degree in Sport and Exercise Science, and MSc in Exercise Physiology at Loughborough University. During these degrees he received several academic awards including the Development Trust Prize for outstanding undergraduate achievement and a Graduate School Full-Fee MSc Scholarship, as well as the Gatorade Sports Science Institute Award and Yakult Prize for outstanding postgraduate achievement. 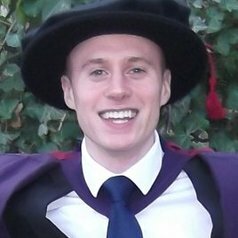 Kevin then completed a fully-funded PhD studentship under the supervision of Dr David Stensel at Loughborough University. During his doctoral programme, Kevin's research was rewarded with the Nutrition Society Postgraduate Competition Prize and BASES Oral Presentation Award. Kevin has a number of research interests in the fields of nutrition, metabolism and exercise physiology. His publication record includes a focus on the influence of exercise and diet on appetite regulation, gastrointestinal hormone release and cardiovascular disease risk factors. He has also published research in relation to nutritional methodologies, ergogenic aids, and statistics. Kevin serves as an editor for the British Journal of Nutrition and the Journal of Nutritional Sciences, jointly leads the Level 5 Metabolism Journal Club, and has published pedagogical research to inform university approaches for teaching and supporting students. Outside of academia, Kevin has won national athletics titles and represented Great Britain at the European Cross Country Championships.